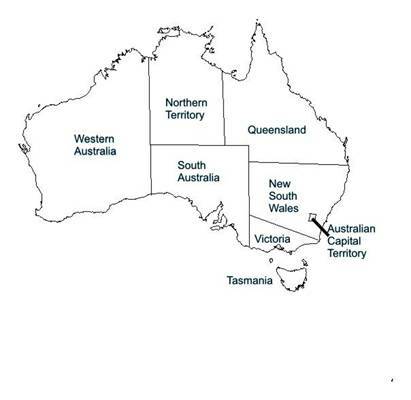 Australia is subdivided into six States and two Territories. In 2002 only two of the States have degree level cartography programs. One is at the Curtin University in the State of Western Australia and one at the RMIT University in the State of Victoria. Provided below is a State/Territory breakdown of cartography and mapping science related programs available in Australia. The Bachelor of Applied Science in Multimedia Cartography focuses on the use of New Media for mapping and its related professions. It has been designed to enable students who are interested in multimedia, information technology, design, electronic publishing and geography to undertake a program that combines all of these skills areas to provide a program that focuses on innovation and unique solutions that enable better visualisations of the world we live in. A holder of the Bachelor of Applied Science in Multimedia Cartography is academically eligible for admission to the Institute of Mapping Sciences Australia (MSIA) and the Australasian Urban & Regional Information Systems Association (AURISA). Undergraduates are eligible for student membership of each of the above organisations. Employment prospects in Multimedia Cartography cover a wide and varied field. Graduates are involved in developing geographic information systems, designing tourist guide publications, interpreting remotely sensed satellite images, producing topographic and base maps, compiling street directories, operating desktop mapping packages and developing computer mapping systems. They are employed by many private and public sector organisations. The University offers a three year degree in cartography. In addition, a fourth year for honours in cartography is offered which leads directly into the Master of Science (Surveying and Mapping) and the Doctor of Philosophy (PhD). Through the cartography degree program students gain expertise from a range of areas such as computing, environmental science, film and print technology, geography, geology, management, mathematics and physics as well as the more creative aspects such as art and design. Students will also learn how to interpret, store, display and manage data which is used in representing both the natural and cultural environment. Cartography graduates are eligible to apply for associate membership of the Institution of Surveyors Australia Inc (ISA) and the Mapping Sciences Institute, Australia (MSIA) and, after a period of work experience, may obtain full membership. While enrolled at the University, students are eligible for student membership of the ISA free of cost and of the MSIA at greatly reduced rates. Cartographers are employed by local government and State mapping authorities, exploration and mining industries, environmental mapping agencies, and private mapping and town planning companies. The Australian Spatial Data Infrastructure (ASDI) is a national initiative sponsored by ANZLIC (The Spatial Information Council) to provide better access for all Australians to essential geographic information (spatial data). In this way the ASDI will help sound decision making in supporting Australia's economic growth and its social and environmental activities.